Midwest Starz was held at Monticello High School, in Monticello, MN. The high school was beautiful, and things were laid out very nicely. There were 2 stages, one for groups, one for solos, duets, etc. There were signs pointing groups to their assigned dressing areas, which was nice. Unfortunately, they were not labeled the same as the actual areas (ours said “fieldhouse” and it actually said “auditorium,” or something like that). Not a big deal, as there were lots of Eau Claire School of Dance (ECSOD) parents around to point us the right way. It was pouring outside when we got there, so open air parking was a bummer, but at least it was free, and there was plenty of it. I was able to sneak over to the second stage to watch a couple of the older girls from ECSOD do their tap duet. That was fun to watch. In talking to one of the other moms, she said the roof was leaking and there were water spots on the stage. I couldn’t really see them… I hope no one slipped and/or got hurt! There was a HUGE store area with shirts, pants, dancewear, etc. Prices seemed a bit high from what I could see. One thing I really thought was cool, was that they had photographers taking action shots during each dance. There was a row of laptops people could view the pictures on. Of course, you could purchase a picture for $5… Grace’s grandma bought her an awesome close up of her with her mask, and a frame to put it in that said “Starz.” That was REALLY cool!! The other dancers did not blow me away at this competition like they did at Hall of Fame. There were some good dances, but very few that left me saying WOW! It was good for our girls to be dancing against other girls (and a few boys) who were at a comparable level. I was not impressed with the judging for this competition. I thought our girls did an awesome job, and they were scored with Gold in both their dances. Some of the dances that placed in the top 4 or 5, I didn’t think had done as good as our girls. Who knows what the judges saw that I didn’t, or didn’t see that I did… I’d be interested in hearing/reading the judges’ comments. I’m sure they got docked for the mask that fell apart again just as the girls went on stage, but I still thought they should have at least been ranked with High Gold. Oh well. There really weren’t any extra awards at this competition, which was fine, but the awards ceremony was still fun. The girls thought it was cool to get a trophy (for the school), in addition to their pins. The day seemed to be a whirlwhind of activity, with not enough caffeine. Like each of the other competitions, there were things I liked, and things I didn’t. 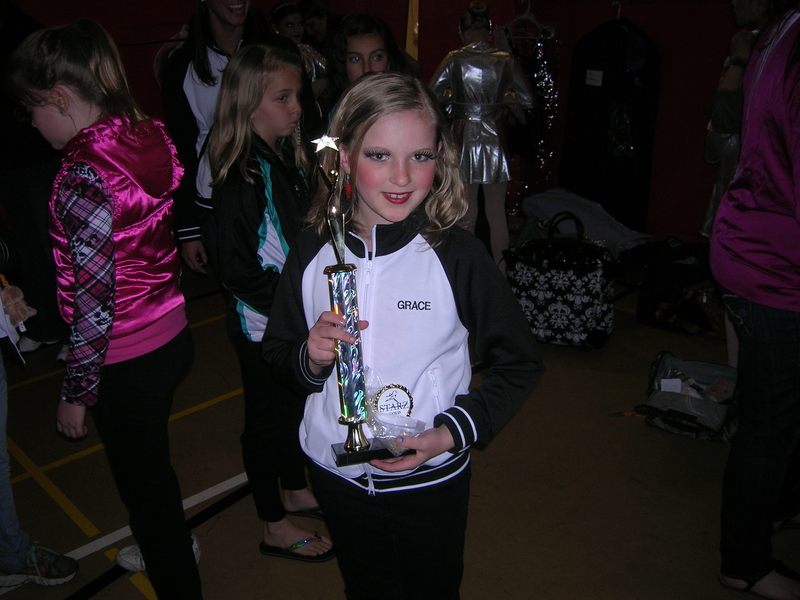 As a Dancem0m, it was another competition under our belts!